This once rustic and deteriorating barn is now a stylish studio for cottage ware, metal art and chic clothing. 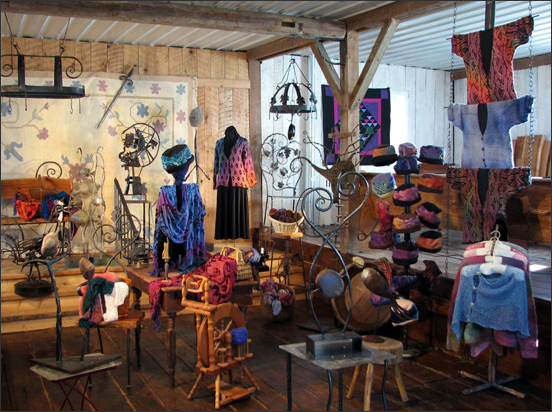 In the frigid fields of Waunakee, Wisconsin, an unlikely artist duo has combined forces and set up shop in a barn. Literally. 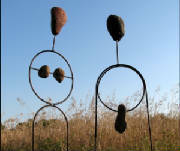 Fabric painter and knitter, Anne Alessi, and metal artist and blacksmith, Don Esser have created the SteelWool Studio, combining both their crafts into the name. Originally located on a dairy farm, the stone and timber frame barn was built in 1904. The interior walls of the studio were built with found lumber and recycled wood from the area. With the original floors and beam construction, the barn now houses various work and display spaces. Although the studio first opened last November, both artists have long histories with their craft. Esser has been working with metal for over 30 years. 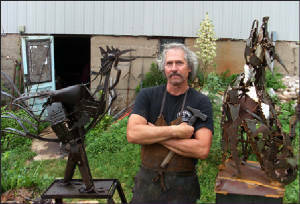 His portfolio includes a variety of large sculptures built from scrap metal, as well as more functional pieces such as coat racks and plant hangers.Also, he has taught blacksmithing classes, done commission work, and has exhibited work in galleries. During the summer months, Esser makes wine, so he is proud of his vineyard-influenced art. Alessi’s love of color was instilled in her as a child. She received a formal fine arts education in sculpture and portraiture, but finally found her niche with fabrics. In addition to being a quilter, knitter and seamstress, she hand-paints her wools and fabrics. Using her wide array of talents, she now offers a diverse line of products,including sweaters, hats and wall hangings. To learn more about this unique pair, visit the website for SteelWool Studio.